The whole-house divestiture continues. Last week was extremely satisfying — but I’m not sure how much longer I can continue at this pace. Riding it while I can. This work supplants my writing practice for the moment. So, my plan this week would be, to allocate 20 minutes after lunch to write before getting back to work. Wonderful, irmamirta! How’s it going? 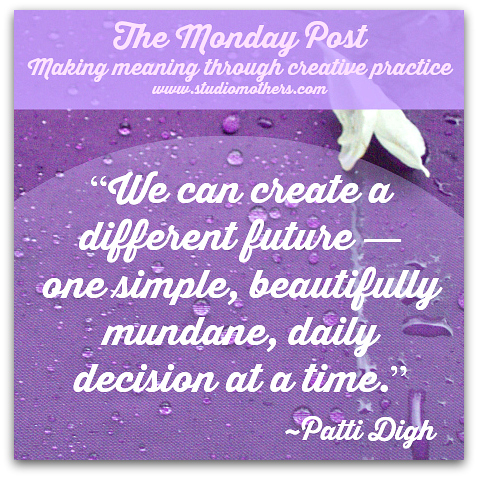 Perfect reminder: we create our lives in every moment. Thank you! I am struggling with everything right now. I don’t know where to start. My life in vacation last weekend has stolen my soul and now am back to reality but there really isn’t anything I can do to make things easier for me. I hope that your facebook hiatus is helping you feel more focused on your daily practice, Jennifer!